Defender Ayman Ashraf struck deep in stoppage time as Ahly salvaged a 2-2 draw with Dakhleya in an Egyptian Premier League thriller on Saturday but lost ground in the title race. The unfancied Dakhleya looked to have snatched a stunning win when a sumptuous 30-metre piledriver from Hussein Ragab found the top corner of the net with nine minutes remaining to put his side 2-1 up. However, Ashraf popped up at the far post to volley home a flick from the otherwise wasteful Walid Azaro to secure a share of spoils, although the draw would do little favour to a faltering Ahly side. Ahly went ahead early in the second half through a simple finish from winger Ahmed El-Sheikh before experienced striker Hossam Salama brought Dakhleya level after robbing the last defender, the novice Ahmed Alaa. The Red Devils, who are eyeing a fourth successive title, are sixth in the table with 24 points, 14 behind leaders and Cairo rivals Zamalek who played three matches more. Dakhleya moved up to 12th on 19 points. Dakhleya adopted a bold approach from the outset, moving the ball around smoothly and pouring forward at times. They created the first chance when Egyptian international winger Islam Gaber superbly skipped past two challengers and rushed towards the area before curling a low shot just wide. Ahly then took control, with playmaker Nasser Maher rattling the post with a powerful volley. In an end-to-end second half, El-Sheikh finished off a fine three-man move to break the deadlock on 49 minutes, curling a low shot beyond the keeper's reach and into the corner of the net. But a dreadful defensive blunder cost Ahly their lead seven minutes later when Alaa was dispossessed and Salama broke clear to fire past the advancing Sherif Ekramy. 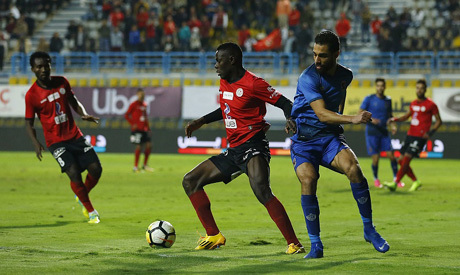 With Ahly wasting several goal-scoring chances to regain their advantage, including a header from off-form Moroccan striker Azaro that was denied by the bar, Dakhleya took them by surprise on 81 minutes. Running unopposed from the halfway line, Ragab let fly from 30 meters, leaving Ekramy with no chance as Dakhleya looked close to inflicting a third league defeat on Ahly. Ashraf had the last word though, but Ahly will regret dropping two points as they next face the big-spending Pyramids FC in a mouthwatering clash on Friday.